For many, Duxford is the spiritual home of the warbird and Flying Legends represents the holy grail for warbird airshows in the United Kingdom. Legends' global reputation brings in visitors and participants from all corners of the world and the daunting transatlantic journey undertaken by Lee Lauderback to bring P-51B Mustang Berlin Express to the UK really epitomises the standing within which this event is held. As a first time visitor to the world famous Flying Legends airshow, I've never before been directly exposed to the history surrounding this event, and the stalwart - almost cult-like - following it attracts from some circles of our hobby. With that in mind, I was eager to experience first hand whether Flying Legends deserved its status as one of the greatest warbird airshows in the world. Traditionally this show hasn't attracted me, but with the attendance of the aforementioned Berlin Express, I decided to take the plunge. This would also be my first visit to Duxford since the change of display lines and the closure of the ubiquitous Tank Bank, so I was keen to see how these changes had affected the quality of flying at the airfield. Running over two days and having succumbed to the advanced ticket only epidemic, a decision had to be made early over which day to attend. In the week running up the event it appeared the Sunday would be the better day for weather and with the addition of what was being advertised as a "pre-show" Red Arrows display, Sunday tickets were duly purchased. Sadly, the day before the event it rapidly became clear that the weather would be better on Saturday with Sunday seeing more cloud cover, once again highlighting the risk taken by visitors to advanced ticket only events, particularly day-trippers. The 2017 edition of Flying Legends would bear witness to the epic journey of Berlin Express from Texas under its own steam - a journey, perhaps, that we would later find out had taken its toll. Many may not know the historical significance of this Mustang's identity; during a dogfight over Paris in 1944, Captain William Overstreet flew the original Berlin Express through the Eiffel Tower in pursuit of a Luftwaffe fighter, this daring exploit immortalising both the man and his machine in history. Whilst in the UK, the aircraft was also scheduled to attend the Air Tattoo the following weekend to take part in the USAF Heritage Flight with an F-22A Raptor. 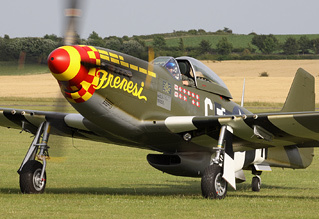 Joining the P-51B from the United States was another Mustang from the Comanche Fighters stable, P-51D Frenesi, which arrived at Duxford rather less triumphantly inside a shipping container. Both Mustangs were resplendent in an olive green paint scheme, with Frenesi carrying detailed mission markings and Berlin Express looking utterly superb, especially those white wall tyres. 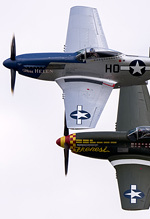 Arguably the two star warbirds attending the event, the Horsemen Flight Team's trio of Mustangs was completed by the rather more familiar "Sharkmouth", as Steve Hinton, Ed Shipley and Dan Friedkin returned to headline Flying Legends once more. I was a Horsemen noviate, so looked forward to seeing their display, especially as they were using the debuting pair of machines. Unfortunately, the anticipation was quite literally 'shattered' the day before when, during one of the first displays of the day, the bulged Malcolm Hood of Berlin Express disintegrated during a high speed pass whilst in the hands of Nick Grey, damaging the empennage and rear control surfaces and putting the aircraft out of action for the foreseeable future. Nevertheless, P-51D Miss Helen was quickly drafted in to fill the slot the following day - the show must go on! The Horsemen do live up to their reputation - if a touch less dynamic than their advertising portrays, it is nonetheless a masterclass of tight, precise formation flying, and set to the perfect musical accompaniment. Whilst the Horsemen and their Mustangs were certainly top billing, I was a little surprised to find that for a show that trades itself on piston fighters, the remainder of star acts were transport types. 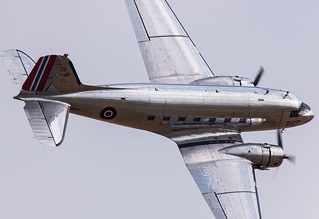 Resplendent in their polished bare metal schemes, the Swiss Classic formation consisting of a DC-3 Dakota and a pair of Beech 18s provided a welcome and unique aerial ballet, complete with breaks and opposition passes. In addition to the Classic formation, Dakota Norway provided their beautiful C-53D Skytrooper which proceeded to perform a display that completely outshone the assembled warbirds in aggression and agility. 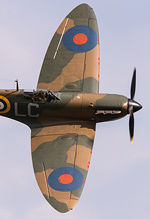 By the standard of recent years, this show was actually quite light on European-based warbirds, with the now regular Red Bull fleet pre-occupied with the Austrian Grand Prix weekend and a mishap earlier in the season ruling out the only foreign Spitfire pencilled-in for the display. Flying Legends is equally famous for its formations and, pleasingly, the Sunday show saw a mixed "Battle of Britain" flypast consisting of five Hurricanes, the Blenheim and three Mk.I Spitfires. 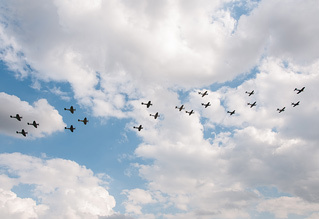 The superb mix of British wartime aerial greats in tight formation was one that will stick with those that attended for quite some time, and was probably the stand out moment of the show. Controversially, the Sunday event included a display by the RAF Red Arrows prior to the commencement of the main flying display. 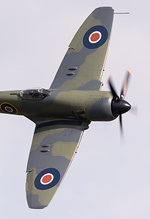 As someone with a casual attitude towards Legends, I can't say I understand the complaints about a modern (arguably legendary) display team performing - it is the same as moaning about Sally B appearing at RIAT. I was however interested to see whether the close proximity to both Duxford Village and the M11 would alter their display line in a similar manner to the debacle that occurred at RAF Cosford. As neither The Fighter Collection or IWM had announced any changes, I was hopeful that the rumours were just that. The surprise and disappointment from the crowd was audible the moment that Red 10 announced that the display would use a 45 degree line at the western end of the airfield. From the eastern end of the airfield closest to the M11, the aircraft were mere dots in a 900mm equivalent photo. The skill of the pilots and the technical excellence of the performance was and never has been in question, however, by default, the extreme distance made this the poorest Red Arrows display I have ever witnessed - a realisation that caused sorrow in the heart of this life long fan of the team. This raises two serious concerns. Firstly, IWM/TFC clearly knew in advance that this was going to be happening, however, unlike Cosford they did not have the courage to advise the ticket-buying public of this. Whilst the stalwart followers of Legends would not care, the attraction of the Red Arrows would likely influence the general public over which day to attend the event, perhaps even their decision to attend the airshow at all. Their appearance certainly influenced the day that I attended, and I can't help but feel it will only serve to deter families and individuals from buying tickets to Duxford airshows again and should have eroded a significant proportion of goodwill shown towards the organisers by enthusiasts and the public alike. Secondly, it is rapidly becoming apparent that the only organisation applying these altered display lines is the RAF. This is a worrying trend that does not bode well for the airshow industry. While it is appreciated that those responsible are interpreting new regulations to the best of their ability, this overly risk averse stance produces the opposite effect to what would be intended - it does not exemplify the safe operation of a world-renowned display team. When all other operators (and international military teams) don't apply the same rules at the same show, it comes across purely as an embarrassment. At the time of writing, their standard performances at RIAT and Yeovilton International Air Day have raised further questions. Why were Cosford and Duxford affected and not Fairford or Yeovilton? The Reds flew directly over Fairford at RIAT and a number of smaller villages at Yeovilton. Surely the same rules apply? If anything it has exposed how hypocritical the RAF have been over their application of these new regulations. It has to stop. I have to be honest and say that on the whole I was not impressed with the flying display. 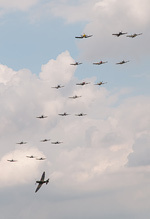 It was unquestionably great to see so many warbirds in the sky at once performing tail chases and aerobatics, however, camera or no camera, the vast majority of the action was so far away from the crowd that the different types and colour schemes merged into black dots and their impact was ruined. Standing at the M11 end there were some close-up moments to be had including some nice photographic opportunities, however, with the horrible light these did not compensate for the predominantly distant displays, especially when the price of entry is taken into account. A real Jekyll and Hyde scenario. One saving grace and a virtually unique opportunity of any Duxford airshow is the flightline walk. 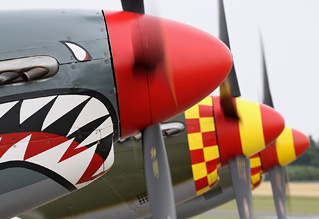 Opening earlier than usual at Flying Legends and also priced lower than at IWM run events, in exchange for £5 enthusiasts get to enter the live side of the airfield prior to the commencement of displays and take close-up images of their favourite warbirds from a variety of angles. This can be a bit of a bun fight at large shows such as this, however, it is an opportunity that should not overlooked. It is an aspect that the organisers should be praised for and we can only hope that is never lost from the show. The 2017 Flying Legends airshow should be remembered for some nice formations, albeit flown far too far away, and for an embarrassing appearance by the Red Arrows - the nature of which was suppressed by the organisers prior to the show. However, what the airshow will be remembered for is TF-51D Miss Velma which suffered engine issues during the Balbo finale. Unable to make it to the airfield, the pilot elected to perform an emergency landing in a field near to the M11. The landing itself represented excellent piloting in a very stressful and dangerous situation - the aircraft remaining upright and apparently in a repairable condition, the end result has been a lucky escape for both pilot and machine. Being brutally honest, after spending a day at the event, I'm not entirely sold on the Flying Legends hype. Apart from the appearance of a few rare US warbirds, I saw nothing out of the ordinary that I haven't seen at normal IWM airshows in the past. The distant display line is crippling Duxford - unfortunately with the extreme close proximity of the M11, I cannot see an exemption being granted here any time soon. Would I attend a Flying Legends again? Perhaps, if they attract a good few star items and it doesn't clash with other airshows. If not, this solid but unspectacular show will be my only visit for the foreseeable future.